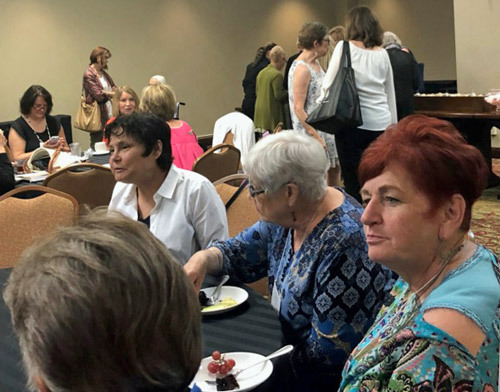 I have just returned from the “Stories from the Heart IX” writing conference in Austin, where I had the honor of spending time in the company of the most open, honest, loving and wise women I’ve had the occasion to meet in a very long time. I don’t even know quite how to put these feelings I have into words because they are so visceral. Let me see if I can share a few glimpses of my time there, just to give you a sense of what I mean. I arrived at a dinner for the Story Circle Network board the night before the first day of the conference and there I was seeing these women I only “talk” to mainly on the Internet. I felt shy for just an instant, then spotted my beloved Pat Bean, who has been in my e-circle writing group since I joined SCN ten years ago. (The e-circles are small groups where we share our writing online.) Pat was wearing her usual tie-dye tee-shirt and the minute she saw me, she stood up and held her arms wide open. The Author and her friends at dinner. 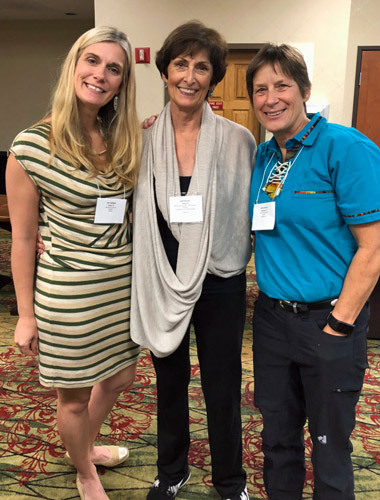 The next day, I presented my pre-conference workshop on Flash Fiction/Flash Memoir and found myself surrounded with women who were all there for the exact same reason I was there: to figure out how to be a better writer. In my presentation, I read them one of my student’s nationally award-winning essays, and as I read, I watched as every woman in that room was moved, some to tears. I was so pleased to see that my student’s writing had touched them; I was just sorry she wasn’t there to witness that reaction for herself. Luncheon Keynote Speaker Bird Mejia shares the power of wild women! Linda Joy Myers, our opening keynote speaker spoke about the power of women breaking their silence and telling their personal truths. She was humble, self-disclosing, real. Bird Mejia, our Sunday lunch keynote speaker, emphasized the importance of embracing who we are and sharing that pride with women of all ages. 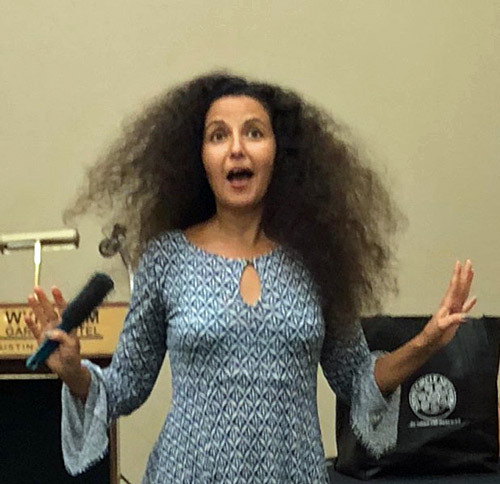 She brushed out her beautiful curled hair to show us the power of the “wild” woman when her locks extended full and wide into a glorious fan that framed her entire head. Jeanne Guy, the incoming SCN president, made us all laugh with her ever-present sense of humor and perfectly timed quips. 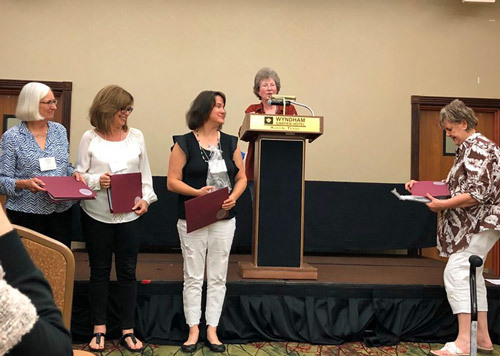 The Sarton winners and finalists awed us with their beautiful words when they did a noon-time reading of excerpts of their books in historical, contemporary, and young adult fiction; memoir as well as biography. Incoming President Jeanne Guy is supported with a friend on each side! The workshop presenters offered insight and advice on a whole host of topics, ranging from writing about your mother without guilt to using the Myers-Briggs Personality Assessment for character development to creating space for writing to publishing through CreateSpace to developing and facilitating a writing-from-life workshop and more and more and more. On Saturday night, there was an open mic where conference attendees could read their work. In between, there were countless conversations about writing, life and each other. The entire weekend could be summed up with these words: love, kindness, generosity, openness, connection, sisterhood, learning, and hugs. 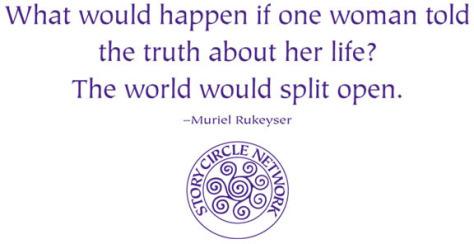 Dear women friends, please join Story Circle Network! This is an organization that can use YOU and your unique gifts, whatever they are. I believe you will find this group exemplifies women helping women at its best. You will not be sorry. You might even find – as I have – your life changed forever through this experience. 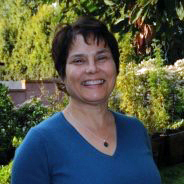 Len Leatherwood: Program Coordinator for SCN’s Online Classes, has been teaching writing privately to students in Beverly Hills for the past 17 years. She has received numerous state and national teaching awards from the Scholastic Artists and Writers Contest. She is a published writer of ‘flash’ fiction/memoir. A longer version of this post appears on Len’s daily blog: 20 Minutes a Day.